Mark Bayliss became the world’s fastest person to complete an ultra endurance triathlon from London’s Marble Arch to the Arc de Triomphe in Paris on Sunday 9 September, writes John Tierney. 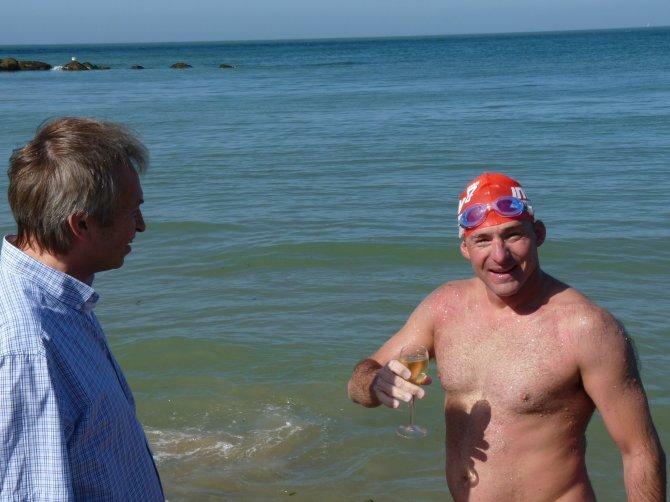 Bayliss from Croydon was the 11th person to have completed the “Arch 2 Arc” and is the only competitor who has achieved the feat without having donned a wetsuit to swim the English Channel. In accordance with ‘English Channel Rules’ he did not wear a wetsuit during his swim leg of the race across the English Channel. Organised by Enduroman, the race from Arch to Arc is simple in concept; run from London to Dover, swim to France and then cycle to Paris in the shortest possible time. “There’s no knowledge base for this kind of event” says Bayliss who ran 87 miles, swam 21 miles and cycled 181 miles en route to smashing five hours off the previous best time by a swimmer with a wetsuit. Bayliss took 73 hours 39 minutes and 12 seconds to cover the distance. His T2 transition involved returning an empty glass of champagne to Monsieur Bouloy and then making his way to the bike start. 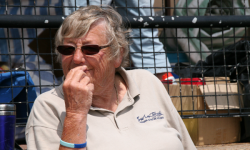 “We took about an hour to get up to Calais to unload. I grabbed a little bit of kip, then went to a restaurant for mussels, chips and coke and was then on my bike three hours and 22 minutes after finishing my swim.” Bayliss used an American manufactured ParleeTT bike and cycling through the night, arrived in world record time in Paris just before lunchtime. Despite working a 65 hour week running a transport company, Bayliss made certain plans for the Arch2Arc. “I signed up for this in March 2010 and expected to go on 5 September this year and I did. I had a fair idea of the route but I didn’t rehearse the route at all.” With a height of 1.77metres, Bayliss maintained his steady weight of 93kgs whilst training 15-20 hours weekly. “I use the gym twice a week, and train most evenings and pretty much all weekend. I trained bloody hard for it and it was just completing a job that I expected of myself.” And his form of celebration was a drive to a local restaurant for dinner with his wife Lucinda.